Thousands of Egyptians have remained in Cairo's Tahrir Square after a rally marking the anniversary of the uprising which toppled President Hosni Mubarak. Some have vowed to stay until another rally planned for Friday, news agencies reported. Many of the protesters are demanding a speedy handover of power from the interim military authorities. Others are urging patience and celebrating the success of Islamist parties in post-Mubarak elections. The Freedom and Justice Party (FJP) of the Muslim Brotherhood - banned under Mr Mubarak - holds the largest number of seats in the newly elected parliament, although this does not mean it will be invited to form a government. Large rallies were also reported in Suez, several parts of the Nile delta, and in the Sinai peninsula. Mr Mubarak, who fled the capital after less than three weeks of protests, has since been put on trial accused of ordering the killing of demonstrators. He denies the charges. The BBC's Jon Leyne, in Cairo, says the mood at the anniversary rally in Tahrir Square has been peaceful, resembling more a huge street party than a political protest. It was a huge crowd. Possibly the biggest gathering in Tahrir Square since that day nearly a year ago when they celebrated the departure of Hosni Mubarak. But as to the political significance - that's a bit harder to assess. Many of the demonstrators complained that not enough had changed in the year since the revolution - they want a quick handover from military to civilian rule. But there are now many competing agendas in Egypt. On one side of the square the Islamists revelled in their recent success in the parliamentary elections. Their leaders are in behind-the-scenes talks with the military over a negotiated handover of power later this year. On the other side of the square, liberals and representatives of the youth movement were more openly antagonistic towards Egypt's military rulers. Many more people came just to enjoy what felt like a huge street party. But while everyone still jostles for power in Egypt, sooner or later someone is going to have to take responsibility for the tough decisions needed to get this country moving again. The various groups are all competing to claim ownership of the revolution, he says, from the youth movement which began the protests a year ago, to the Muslim Brotherhood, and the Supreme Council of the Armed Forces (Scaf), which took power last February after Mr Mubarak stepped down. Many of the protesters demanded an immediate handover of power. "I am not here to celebrate. I am here for a second revolution," said unemployed Attiya Mohammed Attiya. "The military council is made of remnants of the Mubarak regime. We will only succeed when we remove them from power." Chef Hala Rashad told AFP: "We will keep going to Tahrir to push for the goals of the revolution, no matter what. "The military council has done nothing. They are behaving just like the old regime. We have not received our rights and the country is a mess." Other groups chanted "Down with military rule" and "Revolution until victory, revolution in all of Egypt's streets". But supporters of the Muslim Brotherhood said the protests should end and the new leaders be given time to move Egypt forward. Teacher Alaa Mohammed said the military council had overseen the "cleanest elections ever" and protected the revolution. 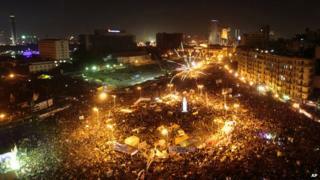 Others said they had turned out to remember the more than 850 people killed during the Tahrir Square protests. "We should not forget that there was bloodshed here. This is not a celebration, but it is a big event to send our condolences to our brothers who passed away between the 25th of last January and now," said Walid Saad. On Tuesday, Scaf chairman Field Marshal Mohamed Hussein Tantawi said the state of emergency, which has been in place in Egypt almost continuously since 1967, was to be lifted. Image caption People brought their children to the rally, daubed in patriotic colours and slogans, and the square was a sea of Egyptian flags. What does Egypt's parliament look like? But Field Marshall Tantawi said the law would still be applied in cases of "thuggery", without giving any details. The military has used the term "thugs" to justify the crackdown on people demanding a return to civilian rule. An end to the much-hated law had been a key demand of the protesters. During his nearly 30 years in power, Mr Mubarak had repeatedly promised to lift the decree and then failed to do so. Last year, the generals widened the scope of the emergency law to include labour strikes, traffic disruption and spreading false information. The military council has also announced that more than 1,900 prisoners have been pardoned by Field Marshall Tantawi - they reportedly include prominent blogger Michael Nabil, who was jailed for insulting the armed forces.